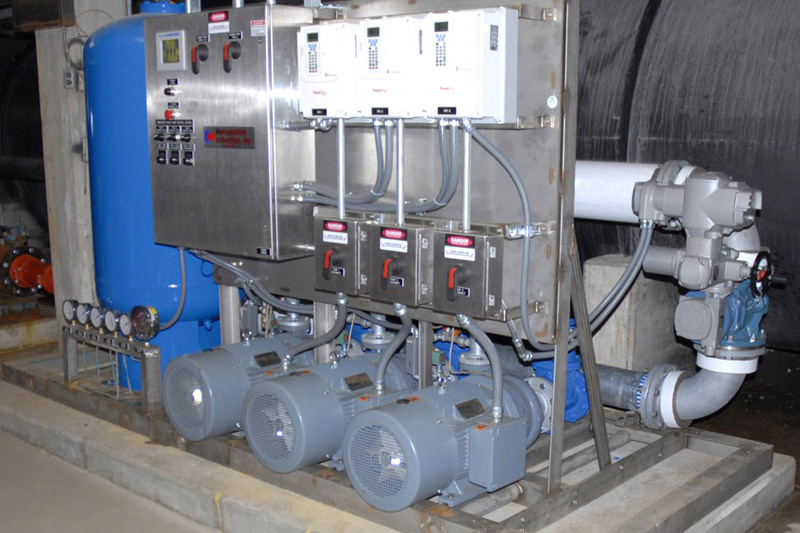 To supply the desired cooling water to the facility, Metropolitan provided a customized triplex booster pump system. One of the primary aspects of our company that makes Metropolitan Industries an ideal partner for business is our dedicated design and service staffs. No matter how complex your job may be, Metropolitan is determined to meet your needs and requirements. At times we are faced with projects in which strict specifications must be followed. We take customer specifications with great seriousness and can customize projects to meet important guidelines. A premier example of our ability to provide customized solutions can be illustrated by the work done at a large municipal water treatment facility that conducts o-zone generation. 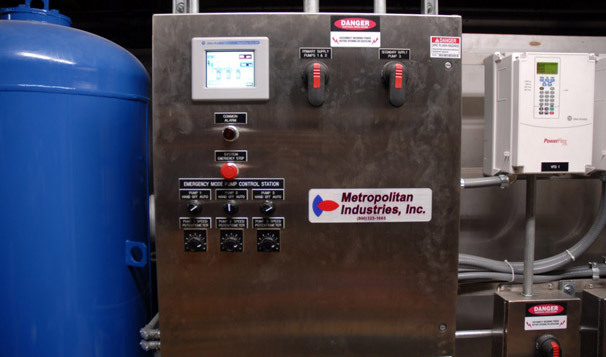 Metropolitan was first contacted by Symbiont Science, Engineering & Construction, Inc. in 2011 to provide a Metro-Varipac triplex booster pump system to supply cooling water to the facility. The existing pressure boosting system the customer had been using ran at a constant speed. Metropolitan implemented the triplex system with a design point of 300 GPM at 185.5 feet of TDH to become the primary system. The system runs at a maximum of 425 GPM at 120 feet of TDH, and each pump is rated at a minimum of 25 HP. A 200 PSI rated hydropnuematic pressure tank was also included. Project specifications called for custom programming. Metropolitan was also able to provide the customer with a specialized startup and certified test of the system on-site. A flow meter and all certified pressure gauges were included to meet project specifications and Hydraulic Institute standards. Metropolitan’s Paul Larson, P.E., said stainless steel features were added to the system to provide corrosion resistance. “We integrated a stainless steel skid, stainless steel control panel and galvanized piping which will prevent corrosion, and thus extend the life of the system,” said Larson. Stainless steel features were added as a customized element to the system. The system also came complete with variable frequency drives, eliminating the constant speed control the previous system had utilized. Variable speed controls can save customers thousands in energy savings and eliminate the need for pressure reducing valves. Project engineer Pat Carnahan of Symbiont said Metropolitan’s ability to test a system on-site was a nice change of pace when working on this type of project. Carnahan also noted that Symbiont was pleased to find that the pump skid was constructed and delivered to their precise layout and control requirements. Part of Metropolitan’s commitment to customer service is sharing our expertise with customers, operators and engineers. Metropolitan provided on-site training for the customer to ensure the transition from the previous system to the new system was proficient and easy. Overall, Laskowski said the project demonstrates Metropolitan’s flexibility and dedication to providing customers with projects that match precise requirements. Upgrading Your Municipalities' Booster System? Learn more about Metropolitan’s complete packaged booster systems, custom designed and engineered to meet the unique needs of each application.